A respected investment banker has a plan that he says could save the Ernest N. Morial Convention Center hundreds of millions of dollars in its controversial deal to build a 1,200-room hotel. So far, the response from the center’s board? No thanks. Keith Butler, the investment banker, sought to present his idea to the board at its meeting Wednesday. Melvin Rodrigue, the board chairman, gave Butler two minutes, the standard time for an outside speaker. Earlier that day, Butler, a Harvard Business School graduate from New Orleans who has been an investment banker since 1982, had sent the board’s outside financial adviser a 33-page analysis of why Butler’s proposal would offer big savings. In his analysis, he said developers of the hotel would pay an excessive interest rate — 8.2 percent — to finance the massive Omni hotel at the upriver end of the Convention Center. Ground has yet to break on the project. Butler believes the Ernest N. Morial Exhibition Hall Authority, the board that oversees the center, ought to issue the bonds itself. Given the authority’s good credit rating, he said, it could issue the bonds at a 5 percent interest rate, as it has in the past. The difference between the 8.2 percent and 5 percent rates translates to a savings of about $16.5 million per year in interest payments for the $516 million in bonds that the developers are proposing to issue as part of the financing for the project. Based on the present value of that $16.5 million over the life of the bonds, Butler said, it translates into a better deal by about $330 million. A request for an interview with Rodrigue and Michael Sawaya, the Convention Center’s general manager, led to an email response from Sawaya. “While we can appreciate alternative approaches, we are confident in PFM’s recommendations and that they have done the proper diligence to provide us with a recommendation,” he wrote. PFM is a financial consulting firm that has worked for years for various local clients, including the city. 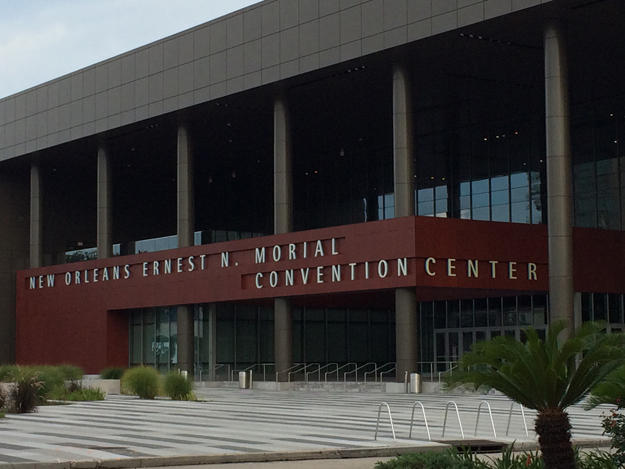 The debate over how to finance the hotel comes at a time when the Convention Center is under fire for holding $235 million in reserves, while Mayor LaToya Cantrell says the city needs $75 million to address immediate needs of the Sewerage & Water Board. Of the $75 million, $40 million would cover bills that are past due while $35 million would pay for emergency repairs to machinery. The hotel project’s developers are expected to include local hotel owners Darryl Berger and Joe Jaeger, as well as Matthews Southwest Hospitality, a Texas-based real estate firm, and Preston Hollow Capital, a Texas finance company. The developers and Convention Center officials say the hotel is needed to bring convention goers to the upriver end of the giant exhibition hall, which is now mostly unused. Center officials wanted to nail down the final plan for the hotel in July, but questions about the public subsidies for the venture have stalled the proposal. Butler notes that the nonprofit Bureau of Governmental Research estimates that under the proposed financing, the public would provide $330 million in present-day dollars in subsidies to the hotel. If the Convention Center were to issue the bonds, Butler believes, the $330 million in savings would eliminate the need for a public subsidy. The center responded to BGR’s analysis by hiring its own consultant, who said the total subsidy would actually amount to $171 million. Butler ended up speaking to the board on Wednesday for about five minutes. Taking up half the time was a dispute over his contention that the board’s chief outside financial adviser, Lisa Daniel, had failed to respond to him since January. Daniel, based in Memphis, is managing director of PFM Financial Advisors. The board did not address the substance of Butler’s financing plan. Board member Ronald Guidry Sr., who owns a west bank insurance agency, said that he had asked at the board’s last meeting to have Daniel meet with Butler to discuss his ideas. That never happened. Rodrigue interjected that he had failed to convey that message to Daniel. He apologized to Guidry. Guidry then sought to have the board direct Daniel to meet with Butler. That effort failed on a 5-5 vote. Rodrigue cast the deciding “no” vote. Voting yes were: Guidry; Tiger Hammond, president of the Greater New Orleans AFL-CIO; Eddie Jacobs of the Nola Hotel Group; Bonita Robertson, director of civic leadership at the Greater New Orleans Foundation; and Dottie Belletto, president and chief executive officer of NOCCI, which handles event marketing and logistics. Voting no were: Rodrigue, who is president and part-owner of Galatoire’s restaurant, which is also partly owned by Advocate owner John Georges; Al Groos, general manager of the Royal Sonesta Hotel; Ryan Berni, a political consultant who held senior posts for then-Mayor Mitch Landrieu; Steven Pettus, who is managing partner of Dickie Brennan & Co., which owns French Quarter restaurants; and Stephen Caputo, general manager of the Hotel Monteleone. Butler said her report was based on a preliminary analysis of his plan. On Thursday, Guidry was baffled that the board doesn’t seem interested in hearing from Butler and discussing his plan in depth. In an interview Thursday, Butler did not rule out playing a role in helping underwrite the sale of bonds if the Convention Center were to issue them, as he recommends. But he said his main motivation is making sure that the city and state get the best deal possible for the expensive venture. “It’s so important to the city’s competitiveness,” he said.